Another year, another production of The Merchant of Venice! 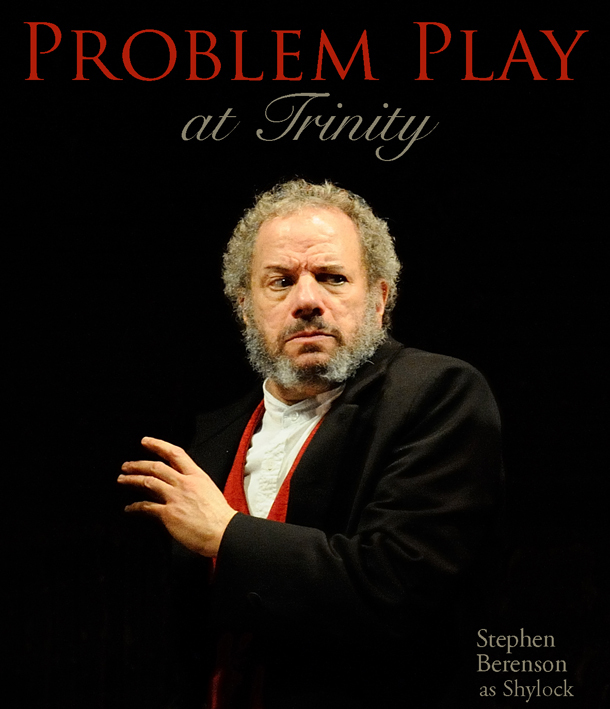 After mountings at the Actors' Shakespeare Project, and ArtsEmerson, now Trinity Rep has decided to have a go at what I suppose counts as Shakespeare's most "controversial" comedy. Sigh. I know I shouldn't complain - but even a bardolator like me could be forgiven, I think, for half-hoping some other Shakespeare play might get half the attention from our local theatres that The Merchant of Venice does. But then no other Shakespeare comedy can boast the same level of something that's irresistible to the our theatrical mindset these days. I'm talking, of course, about anti-Semitism. The Merchant of Venice reeks of it, and theatre people just can't get enough; they eat up the stuff like it's cotton candy, perhaps because nothing's sweeter than analyzing other people's bigotry. By now I think I've seen poor Shylock's yarmulke torn off just about every way possible; I've seen the him kicked, shoved, knocked to the ground, and (of course!) spat upon. I've watched him crawl across the stage on all fours; I've seen his soul destroyed over and over again, as evil Christians snickered at his suffering. It used to be that theatres trimmed this play of its bigoted content; these days, we revel in it. But needless to say, anti-Semitism has probably survived all these object demonstrations of its horrors; let's be honest, it survived the Holocaust, didn't it. So I'm pretty sure it's still out there, biding its time, like every other prejudice. Indeed, these earnest, guiltily-enacted depictions of bigotry may make everyone feel very virtuous, but I'm never sure what social effect they actually have. Did Atticus Finch ever persuade a racist to mend his or her ways? I could be wrong, but somehow I don't think so. Nor am I entirely persuaded that art is best defined as a form of moral pedagogy (as our professors like to tell us). It seems more likely (to me) that these kinds of productions may lull the modern audience into an insidious form of moral self-satisfaction; disapproving of The Merchant of Venice allows us to imagine that our own society is free of unjust and ugly social codes. When of course it's not (indeed, far from it). If a "deconstruction" of the oppression embedded in The Merchant of Venice ever startled a modern-day audience member into self-awareness, if any one of them ever gazed down at his or her i-Phone and suddenly realized "Wait a minute - I can't use this; it was built by slaves!," then I might be persuaded. But so far as I've seen, "critical thinking" rarely leads to moral awakening; indeed, it usually only ends in pointing the finger at somebody else. Still, what are we to do with The Merchant of Venice? It is the play that defeats every approach taken to it, as it embodies both the best and worst of our civilization. And it's one of the plays that clearly reveals what is so unique about Shakespeare: you may be horrified at the prejudices the Bard stoops to satisfy (and I don't blame you), but you must perforce be stunned by the way he simultaneously undermines and reverses everything which appears superficially true about his play. I think by now the silly canard that Shakespeare was personally anti-Semitic has finally lost its force; but I'm not sure a far more startling fact - that it took centuries for The Merchant of Venice to truly unfold before us, as both an ur-text of anti-Semitism, and a starting point for its negation - to truly sink in. To be honest, I can't recall any other artist, in any form, with a work like this in his or her canon (and Shakespeare has more than one): a work that over time has seemed to negate its own original intent, while retaining - perhaps even augmenting - its sense of greatness. I can't think of anyone but Shakespeare who has managed that. And let's be honest about what it means to "deconstruct" The Merchant of Venice - it only means drawing out the self-critique that is already embedded in the play. To put it bluntly, Shakespeare was "deconstructing" himself more than three hundred years before Lévi-Strauss or Foucault or Derrida were even born. One stereotype meets another? 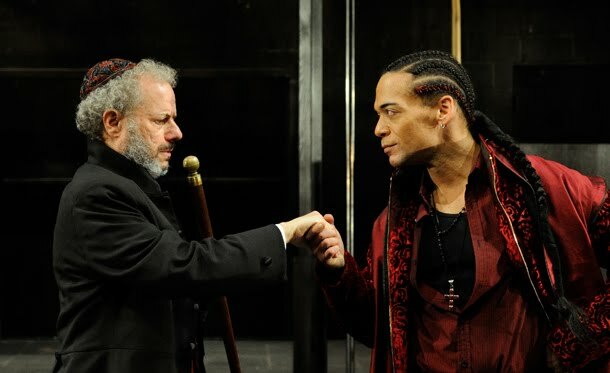 Stephen Berenseon's Shylock greets Joe Wilson, Jr.'s Antonio. The same nearly-terrifying powers of insight extend from Shakespeare's treatment of anti-Semitism to inform his entire play, of course. So while I applaud our modern deconstructions of the script's noxious surface - and of course all ritual denunciations of racism, sexism, and the rest - I'd clap even louder if I felt all of The Merchant of Venice received as thoughtful an artistic treatment as its anti-Semitic passages do. For what seems to me most pertinent about the play now is not its treatment of Shylock, but rather its treatment of money, and the way love is so often bound up with it, consciously and unconsciously. We forget, in fact, that this relationship is the actual theme of the text - even though the Bard lays it out baldly in his title (if with a wink we read into "Venice" everything it symbolizes). And if anti-Semitism has been "defeated," at least among the chattering classes, rest assured the corrupting allure of money has not; indeed, we're now half-convinced that a purely mercantile, libertarian society can cure us of every prejudicial ill. But I don't think the Bard would agree. No, The Merchant of Venice, which is set, after all, in one of the first outposts of capitalism, tells it like it is: cosmopolitanism doesn't save Shylock; the free market always casts a blind eye on bigotry, and indeed often finds a way to profit from it. Well, I'm afraid that was rather a long preamble to a review of what I thought was a disappointing production, and an unfortunate misstep in what has been a very strong year for Trinity in general. Director Curt Columbus clearly had it in mind to extend into his spring season the concern with prejudice that informed the best of Trinity's work last fall (which featured His Girl Friday and Clybourne Park). And indeed, at times you can almost feel him groping for a "shocking" new angle on anti-Semitism; but there aren't many new angles on that, are there, and the complexity of the surrounding play, and the strange way in which anti-Semitism is embedded within that play, seem to defeat him somehow - perhaps because his stylistic flourishes feel thin against the text he imagines he's criticizing; you get the impression that in intellectual terms, he doesn't fully understand yet what he's up against. It doesn't help that he mixes and matches styles and modes (Are we in the 30's? the Renaissance? Or just Central Park?) and is reduced at times to dumb shows and rather garish stage pictures to put his points across - I often felt, as I did with Melia Bensussen's Twelfth Night last winter, that I was watching the director diagram the play rather than direct it. And it's always a bad sign, frankly, when a director feels he must cut some of a play's greatest speeches, as Columbus does here (Lorenzo's meditation on music, one of the joys of the entire canon, has gone missing, along with Old Gobbo's scene, the moving text of Antonio's letter to Bassanio, and I'm sure other worthy bits that I've forgotten). Columbus does cleverly re-arrange the Tubal scene to yield a dramatic black-out to close the first act; but it's his one successful gambit after about a dozen failed ones. Drawing a blank: Stephen Thorne and Mary C. Davis. To make matters worse, many of the actors seemed as lost at sea as Antonio's merchandise. Stephen Berenson made a forceful, but rather uncomplicated, Shylock; don't look to his interpretation for any sense of magisterial depth - but I will always remember his performance for a poignant grace note at its finish: after Shylock's forced conversion at the hands of the Venetian court, his yarmulke lost, Berenson left the stage with his hand still groping to cover his head - he was determined somehow, despite everything, to stay true to his faith; it was the only glimpse of the character's tragic stature in the production, but it was a devastating one. Would that the rest of the cast fared half so well! But I'm afraid this production is littered with listless performances. Stephen Thorne was simply the blankest Bassanio I've ever seen, while Joe Wilson Jr. made Antonio floridly gay, but pointlessly so, for we never believed in his love for Bassanio for a minute. Meanwhile, as Portia, sturdy, smart newcomer Mary C. Davis showed promise, and managed the early comic scenes well enough; but she couldn't save the character from Columbus's misguided decision to turn her into a Christian avenger, and then back into a comedienne. 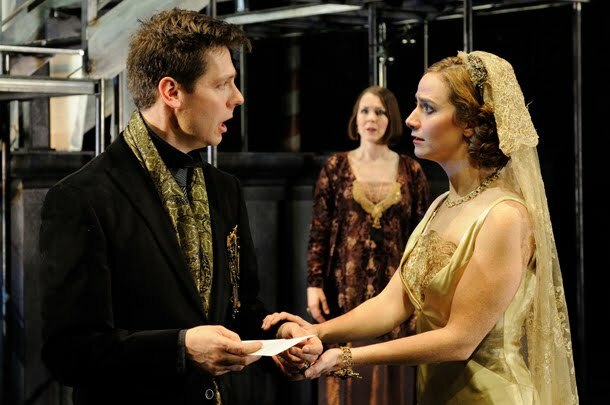 Rachael Warren made a more-appealing, and consistent, Nerissa, however, and you could tell the other young actors on stage - Will Austin, Caroline Kaplan, Darien Battle - likewise had some talent, but weren't able to access it here. The show did come alive in its comic business - which is unusual, because the set-pieces in Merchant are pretty static. Nevertheless, Joe Wilson, Jr. and Fred Sullivan, Jr., both made hilarious hay out of the Princes of Morocco and Aragon, respectively (by, of course, gently playing on prejudices, but never mind!). Sullivan was particularly busy; he also contributed an intriguing cameo as Tubal - indeed, he may have suggested more mordant depth in Tubal than Berenson did in Shylock - as well as a broader turn as Gratiano. Alas, I couldn't help but feel that his lesser work as Gratiano typified too much of the production, though: strident, overconfident, and unevocative. I have yet to see a production that doesn't drop Old Gobbo's scene which serves as a satyr-play in miniature of Shylock's recounting of the story of Jacob and Laban, and also undermines Launcelot's role as a foil to the moral pretentiousness of the nobility. Oh, you still see Old Gobbo sometimes, although less and less often, I agree; I think none of the three local productions featured him. You missed, though, what is one of his key functions: he pre-figures Shylock's blindness regarding Jessica, while re-stating the theme of inter-generational relations in a low-comedy key. It's also a presaging of Portia's plot to find loopholes in her father's will. So, the deception occurs in every father-child relationship in the play. Uh - she doesn't "plot." She is tempted to find loopholes, then decides against it.